With the completion of the 26th Annual Cruise-A-Thon, sponsored by "Travel Trade" magazine and attended by about 800 cruise agents in Vancouver May 15-18, and the Second Annual UK Cruise Convention, organised by the Association of Cruise Experts and attended by about 500 agents in Southampton last week, now is a good time to look at the latest issues involving the distribution of the cruise product. In addition to conference proceedings, agents in Vancouver got a chance to inspect Carnival Spirit, Celebrity Millennium, Amsterdam, Ryndam, Veendam and Volendam, Norwegian Sun and Sapphire Princess, while those in Southampton were able to see Cunard's Queen Elizabeth 2 and Queen Victoria, P&O's Arcadia and Aurora, Crown Princess and mega ship Independence of the Seas. Home-based agencies have also begun to develop in the UK, starting with Travel Counsellors, a firm formed in 1994 and more recently Go Cruise, an organisation that was bought out by Fred Olsen Travel last year. Now with over 900 agents worldwide, Travel Counsellors is expanding into North America. As part of this expansion, Travel Counsellors has engaged former NACTA president Joanie Ogg as its senior vice-president, global sales. An interesting aspect of these home-based agents however is that while many are very productive, more than half of them have very low turnover. At Issue: Who Should Set Cruise Fares? When comparing this month's conferences, by far the most outstanding difference between the North American and UK events is the stance taken by the cruise lines on the subject of cruise agents rebating commission to clients in order to "buy business" and compete on price. In North America, the lines frown upon rebating as they consider it diminishes the value of the cruise product itself, but in the UK the practice has become widespread. Most of the public who know accept the fact that the travel agent's usual remuneration is a commission of 10%, although they may earn more based on productivity, or indeed less, as commission is not paid on port charges or government fees if they are not included in the fare. More recently, rebating has also become a bone of contention with some UK-based lines. In this regard, however, while North American-based lines can come down hard on agents who rebate commission, UK lines claim that differing competition laws mean that they cannot set the price that an agent charges the public. And where in North America almost 50,000 travel agents compete for the business, in the UK there are several large groupings that include not only the multiples but also consortia and call centres. The subject of rebating was not even discussed in Vancouver but in Southampton it was a topic of hot debate, and in both directions. Not only did lines accuse agents of spending too much time competing against themselves and not enough time growing the market but agents accused the lines of endangering their very business. Almost four years ago in North America, first Carnival and then Royal Caribbean, later joined by the more upmarket Crystal Cruises, introduced hard policies that made it difficult for agents to rebate commission. The "Los Angeles Times" summarised these developments in a September 12, 2004, story that began, "two of the major cruise lines, Carnival and Royal Caribbean/Celebrity, last month acted to take at least some of the confusion out of their pricing. Both now restrict travel agents from advertising rebated pricing. Royal Caribbean/Celebrity took the action one step further. It not only doesn't allow advertising of rebates, but it also forbids the practice of rebating altogether." The cruise lines contend that the market can look after cruise pricing and that if enough consumers do not buy then cruise prices will drop anyway without agents having to rebate. 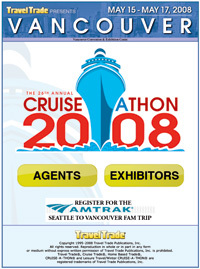 One particular agent, CruiseShipCenters of Vancouver, now part of Expedia, was made an example of when it was put on "stop sell" for a while by Royal Caribbean for crossing the line. In Southampton last week, Nigel Lingard, marketing director for Fred Olsen Cruise Lines, accused agents of spending too much time competing amongst themselves on price and Peter van der Schee, head of brand marketing for Princess, told agents they should stop wasting their time on price shoppers, who are not loyal anyway, and suggested they should concentrate on first-timers. In a market that needs more customers each year, the cruise lines need more first timers as well as repeaters. But Princess is also part of Complete Cruise Solution, that also includes P&O, Ocean Village and Cunard Line, and cut commissions paid to UK agents earlier this year. This did not stop them, however (like prime minister Gordon Brown) from coming up with a compensation package for some of those who lost out. Van der Schee made one interesting proposal, suggesting that agency owners should incentivise agents to book more business by giving them part of the commission rather than rebating it to the general public. On the other hand, several UK agents complained to the lines that they were being priced out of the market by the preferential deals given to larger agents. Carnival UK commercial director Peter Shanks stated that UK law prevented lines from dictating the price at which agents can sell their cruises, adding that those with volume would always get preferential terms. On Friday, a letter from Reg Holmes, director of The Travel Desk in Worthing, appeared in the UK's "Travel Trade Gazette" in which he said, "Complete Cruise Solution is obsessed by volumes, not margins, and frustrates us at every turn." He mentioned two regular clients who sought competitive quotations, stating that "in each case they had been quoted about 8% less than the net we would have paid to P&O." Holmes went on to add that when he called their marketing department, "they said that these big agencies get very high overrides, which they had chosen to use to subsidise selling prices, and that if I raised my sales I could earn these too." This situation has led to stories appearing in the UK travel trade press this month about the barriers that make it difficult for new agents to start selling cruises, something that the cruise lines need badly when they want to grow the market by 15% or more a year. This situation differs completely from that in the United States, where the same Carnival has openly stated that one of the reasons for trying to stop rebates was to allow smaller agents to be able to compete with larger ones based on service. Indeed, Carnival (and Royal Caribbean) want all those who sell their product to have a "level playing field." There may come a time therefore when a standard scale of commissions will arrive in the UK, as well as elswhere in Europe, as they have in North America. Such price stability would allow the public to investigate the right cruise and itinerary rather than worrying about whether they had received the best "deal." There are always exceptions, of course, such as group fares, senior citizens fares, on board credits and so on, but Royal Caribbean's policy in North America is quite explicit. It states that "no agencies can advertise, market or sell below our published or contracted pricing programs." UK consumers as well as cruise lines should remember that it is not that long since the large Romford-based agency Cruise Control went out of business, in October 2005, after Complete Cruise Solution put them on "stop sell." Some say that Cruise Control got into trouble because of too much rebating while others say they spent too much on advertising, but six months ago it was revealed that creditors who were owed �18.5 million would probably not see a penny. In both North America and the UK, the smaller and more specialist cruise lines each formed an alliance in order to market their products to the respective travel trades. However, the UK-based Niche Cruise Alliance was short-lived. Formed in 2004 by African Safari Club, Hurtigruten, Orient Express, RMS St Helena, Star Clippers and Viking River Cruises, it folded in July last year after seeing an increase of 30% in its members' business over the three years of its existence. More successful has been the North American version, the Niche Cruise Marketing Alliance, which was formed in 1999 and now numbers 16 members from both Europe and North America. In Vancouver, the NCMA conducted a full day of seminars on each of its members, while in Southampton the absence of such a niche cruise group meant that proceedings tended to concentrate on the more mainstream lines. These conventions, in both North America and Europe, provide a great opportunity for cruise agents not only to visit ships and improve their knowledge and skills, but also to network with well-known industry executives. They also provide an interesting way of comparing developments in North America, where the market is more mature, and Europe, where growth is still king. Indeed, in Vancouver, one of the themes was that cruise agents could protect their clients from the falling dollar and the surging euro by sending them to Europe on a cruise!